Join California wholesale specialty insurance professionals and the Western States Surplus Lines Conference for a collaborative meeting for wholesalers transacting business in the western states on June 23-25, 2019 in Monterey, California! Once you register, please promptly book your hotel room directly with Monterey Plaze Hotel and provide group code CIWA19 or visit to ensure you receive our discounted group room rate. Reservations must be made by to guarantee our negotiated room rate. We have filled our room block in the past, so please be sure to make hotel reservations as soon as possible. You may use this link http://tinyurl.com/y5ru4ldd or call 831-920-6710 to reserve your hotel room. 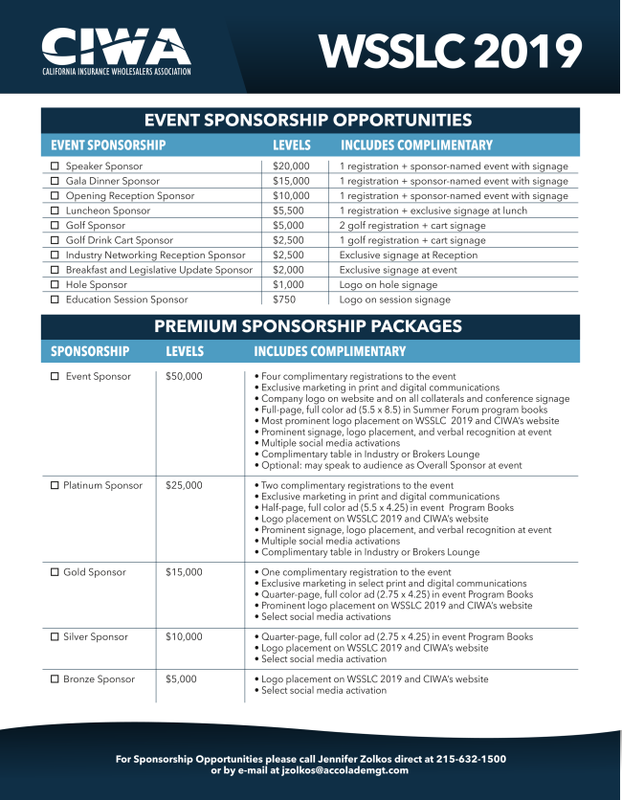 Sponsorship Opportunities are listed here. They are also listed in the registration link. Cancellation requests must be made in writing,received no later than June 8, 2019 to qualify for a refund. All refunds are subject to a 25% processing fee. Qualifyingrefunds will be processed after the event.There will be NO refunds for cancellations made after June 9, 2019 due to hotel guarantees. Substitutions welcome. Photograph and Video PolicyAttendance at CIWA meetings and other activities constitutes an agreement by the attendee to CIWA’s use and distribution (present and future) of theattendee’s image and voice in any reproduction of such events and activities.